Our Ready to Learn program is designed to build partnerships with local community organizations such as childcare centers, schools, libraries, civic groups, and government agencies. We work to provide the best and most appropriate trainings and services for our partner's organization. City Year New York was founded in 2003 to tap the civic potential of New York's young people. Working with schools, corporations and communities, City Year New York's corps members create innovative solutions for today's most pressing issues. IN-SCHOOL: City Year corps members tutor and mentor students in New York City schools to help them reach their academic potential and prepare them for success in and out of the classroom. Serving 24 public schools in Harlem, Brooklyn, Queens, and the South Bronx. AFTER-SCHOOL: City Year corps members facilitate after-school programs that combine education with action. Through hands-on service projects, with an emphasis on literacy, children develop a life-long passion for civic engagement. IN THE COMMUNITY: Led by City Year corps members, thousands of New Yorkers - including corporate executives, community residents, and local school children - unite to transform and beautify their neighborhoods through large-scale community service days. 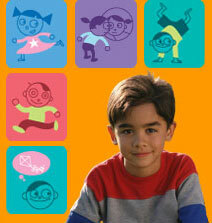 Ready To Learn can be used at home, in childcare centers or in schools. Parents, caregivers and teachers have all had great success with the learning triangle. All you need is a little practice and before you know it, you too will be creating your own learning triangles to share with others. Let us know how you're using Ready To Learn. Send us your learning triangles, and you could be featured on this page! Send your ideas by email to readytolearn@thirteen.org, or by mail to Attn: Ready To Learn, Thirteen/WNET, 450 W 33rd Street, New York, NY 10001. If you have any questions about Thirteen/WNET's Ready To Learn service, please contact us at readytolearn@thirteen.org.